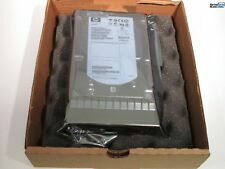 SEAGATE, EMC CHEETAH NS 400GB 10K 3.5" FC HARD DRIVE ST3400755FCV USED. Alternate Part Number. P/N ST3400755FC. Seagate Cheetah NS 400GB FC 3.5" HDD 10K. Any hard drives (if included) have been data wiped and work. AJ711A / AJ711B / 466277-001. 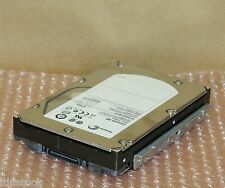 400GB hard disk drive - 10,000 RPM, Fibre Channel (FC) connector. AG638B EVA4400 M6412A Fibre Channel Enclosure. CaddyHP Storageworks EVA M6412A. HP 466277-001. Fits the following models. 1x 400Gb 10k Fibre Channel Seagate Cheetah NS ST34500755FC. In good condition and full working order. We spot problems before they happen with the latest anti-fraud technology. It's safer, it's faster and it's everywhere. If we do not have a part that you need we most likely would be able to source since we do specialize in end of life, hard to find and obsolete hardware. 400GB HDD, FC, 10000rpm, Refurbished. HDD speed 10000 RPM. HDD capacity 400 GB. Interface fiber Channel. Hard drive. Storage drive adapter included No. we do not take any responsibilty after this. Audio Visual. HDD 400GB 10K Hot-Swap 3,5". New Arrivals. we do not take any responsibilty after this. Ending Soon. QUICK LINKS. PC Components. Refurbished . Why Choose Us! HPE 400GB 10K FC EVA M6412 HDD AJ711A. AJ711A / AJ711 / 466277-001. MPN AJ711A. HP 400GB 10 K FIBRE CHANNEL EVA M6412 3.5IN HDD. Storage Capacity 400GB. UNITS MAY HAVE SCRATCHES ON DRIVE SURFACE . SEAGATE ST3400755FC 9EA004-080 400GB 15k 4Gb/s FC 3.5"
FC 3.5" LFF 4Gb/s. Silicon Valley Enterprise. " From Silicon Valley to Your Door Step. Lets make it happen! ". All security labels must be in place. Check photos for example of this type of product. Option Parts: AJ711A, AJ711B. This product is for use in the HPE M6412 Enclosures, Specifically the EVA 4400/6400 and the 8400. Manufacturer: HP. Data Transfer Rate: 2Gb/s. Rotation Speed: 10000Rpm. Part Number: 466277-001. Part Number :AJ711A. Condition : Clean System Pull. HP 3PAR 979-200095 4 x 100GB 3.5" FC SSD Drive Sled Magazine. Compatibility: HP 3PAR 40 Disk Enclosure QL313B. Capacity: 400GB(4 x 100GB 3.5" 15K FC SDD). Blade 657905-001. HP Spares No: 657905-001. P/N: 979-200095/ 657905-001. EMC Seagate ST3400755FCV Cheetah NS 400gb 10k 2/4gbs Fibre HDD FROM: CX-4PDAE-DE. Pulled from: EMC CS-4PDAE-DE system. Including: Drive & Tray from CS-4PDAE-DE, see photo! Distributor Part Number. Form Factor. HP 400Gb 10k Dual Port Fibre Channel FC Hard Drive HDD. 1 x 400Gb Dual Port 10k Fibre Channel Hard Drive. In good condition and full working order. Part Number: 465329-002. Model: ST3450802FC. Caddy DP/N: 0G454P. 1 x Seagate Cheetah NS.2 400GB 10K 4Gb ST3450802FC 3.5" FC HDD with Caddy. Seagate Cheetah NS.2 400GB 10K 4Gb 3.5" FC HDD. EMC PN: 005048973. with Caddy. ALL OUR PRICES INCLUDE GST. HDD 400GB 10K 4G FC. • EMC CX3, CX4, Celerra, VNX. Sourcing hard to find parts. We are the spare parts specialists and assist you with part numbers and cost effective upgrades. IT Hardware Buyback/Trade in program. Capacity 400GB. Generation Fibre Channel. Sub-Category 10K. Data Transfer Rate 2GB/s. Type Hard Drive Hot-Swap. Part Number 465329-002. Rotational Speed 10000RPM. Category Storageworks HDD. MODEL NUMBER: AJ711A. MPN AJ711A. Storage Capacity 400GB. Interface Fibre Channel. Features Hot Swap. Rotation Speed 10000RPM.